Morse: "You think this looks painful. Try it on an acoustic!" When people think of guitarist Steve Morse, the last thing that comes to mind is haunting, vocal-oriented acoustic songs. But that's exactly what they'll get on 11 August when the six-string virtuoso releases Angelfire, a project he collaborated on with 22-year-old singer Sarah Spencer. 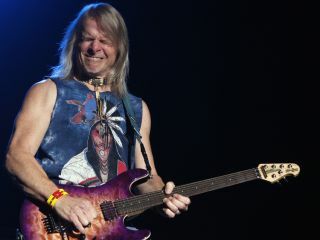 Morse, a six-time Grammy nominee, whose wide range of musical styles has included jazz fusion, bluegrass, southern rock, baroque classical and metal, and who has played with the Dixie Dregs, the Steve Morse Band and Kansas before becoming the longest-tenured guitarist in Deep Purple history (going on 15 years now), teamed up with Spencer, who, at age 14, was cast in a VH1 reality show about musical prodigies. Morse met Spencer when she was 16, and they began collaborating on what was to become Angelfire. "When I first heard Sarah sing, I was amazed. I'd never heard a voice so pure," says Morse. "My first thought was to write an album with her so I could hear and share it with other people." For her part, Spencer says, "Steve has been so generous throughout our collaboration. Everyone knows about his incredible talent, but only a lucky few know about his big heart. I feel so blessed to be able to work with this renaissance man!" We'll hear the album soon enough, and be sure to report on what sounds like something akin to John McLaughlin meeting Sarah McLachlan.